In the 4th century B.C. legendary king Parnavaz into Mtskheta called Iberians, the kartlians qev, into service as heavy spear infantry. Known as "Erie", or "people", they went to war to protect Kartli from the Parthians. This tradition remained, despite years after Parthian, Roman, Khazar, Hunn, Persian, Seljuks, Khwarezmian, Mongolian, and even 8 invasions by the armies of Timur the Lame! 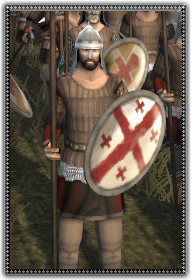 Throughout centuries of foreign invasion, the basic force of the Georgian army was its Kartlian Spearmen infantry. Made up of peasants and small nobles, they love the earth on which they work and they are ready to protect it to their last drop of blood! Strong, courageous, and skillful in the field and in siege, these heavily armed infantrymen overturn the enemy with a powerful wall of spear and shield united against the enemies of Georgia. Kartlian spearmen are equipped with chain-mail armor and manage the chaos of battle with spear and shield.